Copyright (c) – Edgar Rice Burroughs, Inc. Issued in a cardboard sleeve. 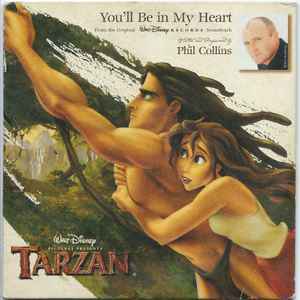 "Printed and manufactured in Germany"
Disc: "Made in Germany by Optimal"
"From the Original Walt Disney Records Soundtrack"
"Walt Disney Pictures Presents Tarzan"
1: Recorded at Conway Studios, Capitol Studios. Mixed at Image Recording. Copyright © 1999 Edgar Rice Burroughs, Inc. and Walt Disney Music Company (ASCAP). Ⓟ 1999 Edgar Rice Burroughs, Inc. and Walt Disney Records, exclusively licensed to edel records GmbH.